It's Buffy's 20th Anniversary and you're going to see tons of memories and reflections about the cast/crew and Buffy's impact on society and how amazing she is. Instead of repeating what many will discuss, I want to take a few moments to reflect on Buffy’s impact on me. Like most people, high school was a strange time for me. Aside from the hormones and figuring out who I am as a person and navigating relationships and friends and all that fun stuff, I was also struggling with severe depression and anxiety. My mental illnesses caused me to miss a lot of opportunities and time. I honestly don’t remember large chunks of that period, but one thing I do remember is Buffy. I loved the movie when it came out. It was silly and campy fun, but the TV show was something else. Without knowing, it spoke to me on a deep level. I didn’t understand being a slayer or changing schools, but I understood feeling and being different. Like Buffy, I was able to hide a lot of my real life. I had friends like Xander and Willow, who knew I was struggling, but I don’t think most of them knew how bad it was. Like Joyce, my parents were loving but didn’t know what to do with/for me. The point is there were parallels between Buffy and me I never saw until many years later. At the time, Buffy was a cool girl with amazing friends, hot guys, an important destiny, and a kickass wardrobe. It wasn’t until I watched Buffy sacrificing herself for Dawn that I began to get an inkling as to how much Buffy meant to me. The sobbing in front of the TV was my indicator. She couldn't be gone. That was not how the show was supposed to end. 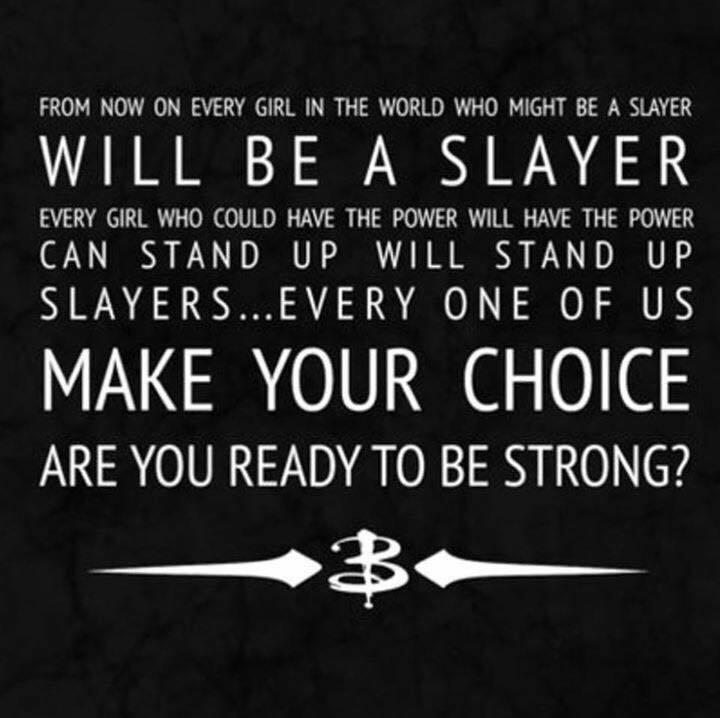 As weird as it sounds in my head, I needed Buffy to show me the way through my life. 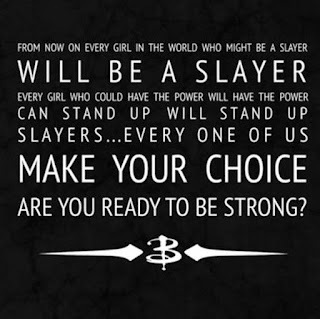 As time has gone by, I've realized Buffy taught me about strength, not just the physical kind. She taught me about being mentally strong. It was never just about how she dealt with being a Slayer and the impossible choices she had to make, it was about how she responded to Joyce’s death and how she tried to balance being a mom and a sister for Dawn. Many people don’t like season six, but to me, season six was everything. Buffy’s ripped out of heaven by her well-meaning friends. Of course, she’s going to be depressed! Of course, she’s going to struggle with adjusting to her new reality! Of course, she’s going to make a ton of mistakes that are more related to her depression than to her being a young adult trying to figure out her place in the world WHILE also being the Slayer! But she got through it. With the help of her friends, who tried to help even though they had no clue what they were doing, Dawn, Giles, and even Spike, who helped by giving Buffy an outlet for her pain (and horniness), Buffy worked through her depression and pain. To someone who has struggled for most of their life, this was and continues to be a big deal. I could go on for hours about how much I love the Scoobies, Angel vs. Spike (Spuffy4Eva! ), needing more Ripper and Giles singing, Buffy’s impact on feminism, the LGBTQIAP+ community and more, but instead I’ll finish this with a thank you to Joss Whedon for creating Buffy and Sarah Michelle Gellar for bringing her to life. Thank you for sneakily impacting my life. And thank you for the black top/red leather pants combo. It’s still a favorite of mine. Happy 20th Anniversary to the cast and crew of Buffy the Vampire Slayer! Like what you just read? Let us know in the comments below and keep up to date by following us on Twitter, Facebook and Instagram! *People dealing with mental illnesses are some of the strongest people I have ever known. These are people fighting a battle against their brains and surviving. The type of strong I am referring to above is the type of strength which comes from joining with other people in the fight. Some people prefer to go it alone and that's okay. They possess a particular kind of strength too. If you or a loved one is struggling with mental illness and you could use some support, check out the National Alliance on Mental Illness (NAMI) for information, resources, and guidance. TOTY Finalists Announced and you can WIN too! McFarlene is coming out with new Harry Potter figures!